This entry was posted in Movie, Novel, Podcast, Podcasts, PopArtsPlace, Review and tagged 300, 90210, Agent Burke, Agent Janssen, Alan Taylor, Alex, Arnold, Arnold Schwarzenegger, Arrow, Bess Motta, Betsy, Bill Paxton, Brian Austin Green, Byung-hun Lee, Cameron Phillips, Castulo Guerra, Chronicles, Claire Danes, ComicBookPage, Cop, Courtney B. Vance, Cromartie, Danny Cooksey, Danny Dyson, David Andrews, Dayo Okeniyi, Derek Reese, Detective Cheung, Detective Hal Vukovich, Detective Harding, Detective Timmons, Diff'rent Strokes, Different Strokes, Dr. Peter Silberman, Dr. Silberman, Earl Boen, Earl Boen Earl Boen ... Dr. Silberman, Ed Traxler, Edward Furlong, Emilia Clarke, Enrique Salceda, Enterprise, Eureka, Gale Anne Hurd, Garret Dillahunt, Genisys, Ginger Ventura, Gregory Alan Williams, Griff Furst, Guardian, Hal Vukovich, Hawaii Five-0, J.K. Simmons, JAG, Jai Courtney, James Cameron, James Ellison, Janelle Voight, Jason Clarke, Jenette Goldstein, Joe Morton, John Connor, John Mayo, Judgement Day, Judging Amy, Judgment Day, Kate Brewster, Kristanna Loken, Kyle Reese, Laeta Kalogridis, Lance Henriksen, Law & Order, Lena Headey, Leslie Hamilton Gearren, Lieutenant Ed Traxler, Linda Hamilton, Lt. Matias, Mark Famiglietti, Matt Buchanan, Matt Smith, Matty Ferraro, Michael Biehn, Michael Gladis, Miles Dyson, Moira Sinise, Nick Stahl, O'Brien, Otto Sanchez, Patrick Lussier, Paul Winfield, Pensacola, Pops, Richard T. Jones, Rick Rossovich, Rise of the Machines, Robert Brewster, Robert Patrick, S. Epatha Merkerson, Salvation, Sandrine Holt, Sarah Connor, Scandal, Scott Petersen, Silberman, Spartacus, Summer Glau, T-1000, T-X, T2, Tarissa Dyson, Terminator, Thomas Dekker, Tim, Todd Voight, Wayne Bastrup, Wings of Gold, Xander Berkeley, Young O'Brien on August 28, 2015 by Kay. “The previously filmed season finale of Mr. Robot contains a graphic scene similar in nature to today’s tragic events in Virginia. Out of respect to the victims, their families and colleagues, and our viewers, we are postponing tonight’s episode. Our thoughts go out to all those affected during this difficult time,” the network said in a statement. It is unfortunate how often art not only imitates life, but life now imitates art in the least becoming of ways. Kudos to USA Network for recognizing the scenes in tonight’s scheduled episode would hit too close to home, not only for those who were directly affected by today’s events, but for those who may have been watching that interview when the events took place. Waiting until Sept 2 to air the season finale, and re-airing a critical episode of Mr. Robot feels like a both considerate and responsible decision on the part of the network. This is not the first time a television show, or network, has found itself in the position of needing to make such a decision — but we can wish it was the last. This entry was posted in Human Interest, PopArtsPlace, Television and tagged Mr. Robot, USA Network on August 26, 2015 by Kay. 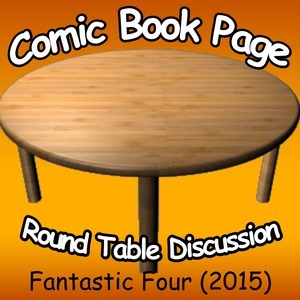 John Mayo, of ComicBookPage, and Kay Kellam, of PopArtsPlace, have a spoilers filled discussion about the recent Fantastic Four movie. This entry was posted in Movie, Podcast, Podcasts, PopArtsPlace, Review and tagged Allegiant, American Horror Story, Assemble, Avengers, Ben Grimm, Castle, Cinematic, ComicBookPage, Dan Castellaneta, Dawn of the Planet of the Apes, Divergent, Dr. Allen, Dr. Doom, Dr. Franklin Storm, Dr. Storm, Entourage, Evan Hannemann, Fantastic Four, FOX, Friday Night Lights, Greek, Grimm, House of Cards, Human Torch, Insurgent, Invisible Woman, Jack Kirby, Jamie Bell, John Mayo, Johnny Storm, Joshua Montes, Kate Mara, Marvel, Michael B. Jordan, Miles Teller, Movie, Mr. Fantastic, Mr. Kenny, Owen Judge, Oz, Parenthood, Professor X, Reed, Reed Richards, Reg E. Cathey, Science Teacher, Stan Lee, Storm, Sue Storm, SuperHero, The Divide, The Simpsons, The Thing, Tim Blake Nelson, Toby Kebbell, TRON: Uprising, TURN, Turn: Washington's Spies, Universe, Victor Von Doom, X-Men, Young Ben, Young Reed on August 21, 2015 by Kay. John Mayo, of ComicBookPage, and Kay Kellam, of PopArtsPlace, talk about their trip to the Texas Comicon 2015 held in San Antonio, Texas on August 7-9, 2015. This entry was posted in Convention, Podcast, Podcasts, PopArtsPlace and tagged 1990, 2015, Barbara Goodson, Blake Foster, Catherine Sutherland, Convention, CW, David Kaye, DC, DC Comics, Flash, Henry Allan, John Wesley Shipp, Power Rangers, Robert Axelrod, Samantha Newark, San Antonio, San Antonio Texas, Texas, Texas Comic Con, Texas Comicon, The Flash, Warner Brothers on August 14, 2015 by Kay.